Paint polishing is one of the most significant topics, and rightfully so. Healthy paint is the foundation of a good-looking, well-detailed car, so a good paint polisher and quality paint polish are critical. Detailers struggle with swirl marks and other paint-related problems more than all other surface issues combined. Without a doubt, one of the most dreaded car care problems we face is the bird. Birds in the air are beautiful to watch fly, but vile to our car's finish. A bird's droppings can quickly cause damage to your paint. Bird droppings are very acidic (pH 3.5 to 4.5). When bird droppings fall on your paint, the acid begins to burn and etch the paint's surface. The longer the bird droppings remain, the greater the damage. I've had bird bomb incidents with my black Mazda Speed3 (the seagulls seem to think it's just a target) that have created damage as deep as 1 to 2 mils. To give you an idea of what that means, notebook paper is approximately 2 mils of thickness. Your car's paint is only 4 to 6 mils thick. The result of bird dropping damage is a dimple in the paint's surface, often as large as an inch or more in diameter. This damage is permanent, but can easily be repaired. The only way to repair the damage caused by bird droppings is to polish the paint. You must use the paint polish to blend the surrounding paint, bringing it down to the same level as the damaged area. This may sound drastic, but it works very well. The only concern is that you're making the paint thinner, so you must be careful not to polish all the way through to the primer. Do so, and you'll have a more noticeable problem than the one the bird left behind. Any good paint polish can be used to fix the damage with a fair amount of rubbing. I've found that it's better to start with a fine polishing compound (a scratch remover formula works well, too), followed by a good hand polish. This diagram shows how the burn from a bird dropping looks on the paint surface. In most cases the burn won't be very deep, but you will see it on the surface of the paint. Polishing helps to level the surrounding paint so the etch mark no longer shows. While it's not really possible to keep birds from bombing your car with their dirty little surprises, you can take steps to limit the damage. The most obvious protection is a car cover (please, not while you're driving!). To limit the damage when you get hit, you need to remove the offending slime as quickly as possible. Don't wait. Get it off of your car. I've found the best way to clean up after a bird is with a good detailing spray or waterless wash product and a microfiber detailing towel. As I'm a clean car fanatic, anyway, I keep a little detailing kit in the trunk of my car. It holds a spray bottle of quick detailing spray, a couple of towels, and my favorite rubber and vinyl dressing. That's all it takes for me to keep the car looking great. When a bird gets me, I spray the bird droppings with a few shots of detailing spray and wipe it off with the towel, turning the towel as necessary to keep a clean wipe on the car. Another way to protect your paint from bird damage is to keep your car waxed or sealed. When your car is properly protected with a wax or sealant, it makes cleanup much easier. The surface becomes slick with a protective coating that when caught early enough, the bird droppings will be a breeze to remove. Just catch it early enough to avoid the potential problems. While wax offers limited protection against a juicy attack, it makes cleanup much easier. You still need to remove the mess as quickly as possible. Summer is tar, sap and bug season. In the summer months, bugs are at full population, trees produce more sap, and the heat softens the asphalt, producing tar balls on tires. While tar and tree sap can be difficult to remove, they do not present a threat to your paint's finish. Bug stains, like bird droppings, are very acidic and represent a significant danger to the beauty of your paint and trim. As you drive, your car is bombarded with small specks of asphalt, tire rubber, grease and oils kicked up by the cars and trucks in front of you. Left on your car's finish, these petroleum-based contaminants will firmly affix themselves to every exterior surface. Soap-and-water washing will do little to remove these ugly black spots. To remove road tar, you need a solvent or strong detergent, like Stoner Tarminator. Most commercial tar removers contain kerosene, mineral spirits or another petroleum distillate combined with lubricants to surround and buffer the road tar from your paint. A more modern solution for tar removal is detailing clay. If the tar is extremely stubborn on your painted surfaces, you can also use a paint cleaning polish, like Wolfgang Paintwork Polish Enhancer. Removing tree sap from a car's finish is a bit more difficult than removing tar or bird droppings. Incorrectly removing hardened sap can scratch your paint. I've found that by hand rubbing the sap spots with mineral spirits, I'm able to easily remove the sap without damaging the finish. Mineral spirits acts as a solvent to break up and dissolve the sap. If there is a large amount of sap on the car, or if the sap has been left on the finish for an extended period of time, it can be a lot of work to remove. For these cases, I discovered that going over the affected areas with an abrasive compound, like McKee's 37 Fast Compound, removes the hardened surface of the sap spots. Then I can hit the sap with the mineral spirits to remove it. The light-duty rubbing compound softens the sap so the mineral spirits can do its job. The goal is to use the least pressure possible, to reduce the risk of scratching or marring the paint. After removing heavy sap, I always buff the treated areas with a good paint polish, like McKee's 37 Fast Polish to clean up any marks created during hand rubbing with solvent and bring the paint back to a high gloss. Your paint is now vulnerable from all of that polishing, The treated area must be re-waxed or sealed. My sealant of choice has always been Wolfgang Deep Gloss Paint Sealant 3.0. The combination of durability and shine is nearly flawless. What's the last thing that goes through a bug's head when it hits your windshield? His rear end, of course! All joking aside, the head-on collision of that juicy June bug on your car's beautiful paint and trim is far from one-sided. As the bug's exoskeleton explodes, acidic fluids are firmly embedded in the surface of your car's paint. Did you know that shellac is a bug byproduct? Think of it, that beautiful old antique table you love is covered with dried bug juice (yuck!). Bug splats on your car amount to little more than shellac mixed with nasty bug parts. Any attempt to remove the calcified remains without the use of a special cleaning solution could result in scratched paint. The secret to removing insect remains is to loosen and dissolve them with a solvent that will cut through the shellac. Stoner Tarminator does a great job for this scenario as well. For bugs with a little extra grip, agitate the paint with a paint-safe insect sponge. If you have a particularly large bug mess, I have discovered a trick that seems to work pretty well. If you use a pre-wax cleaner, such as Zymol HD-Cleanse, apply a small dab to the offending bug splat. Next, cover the spot with a wadded-up tissue. Let it sit for a few minutes, then pinch up the mess and give it a soft wipe with the back side of the tissue. Voila! The bug mess is gone. Say you�re on the road, and you�re the type to be really meticulous when it comes to your vehicles upkeep (Cars are an investment, we don�t blame you!). You can simply get the BLACKFIRE Poly Clay & Lubricant Combo. This is the perfect kit to keep in your car. Diamondite Bug Eraser is a waterless bug remover that will soften the pesky insect remains that will make bug removal easy. Follow that up with the Crystal Gloss Surface Protectant and create a surface so slick, bugs won�t stick! The kit also contains soft microfiber applicators and microfiber applicators to make this a one stop spot for bug-busting action. All of the chemicals used to remove the aforementioned road stains also remove your wax or sealants. After removing tar, sap or bugs, plan to spot wax or re-wax your vehicle. If you don't have time to wax right away, use a quick spray wax like Wolfgang Deep Gloss Spritz Sealant 3.0. This products is great for touch-ups or a quick waxing after the weekly wash.
Left unprotected and out in the elements, your car's paint will quickly oxidize. You won't notice the damage over a period of a month or two, but it's there. After a year in the elements without protection, your paint will be noticeably dull and rough. Paint oxidation is not the kiss of death. Light oxidation is easily removed through regular paint cleaning and polishing. Moderate oxidation can also be repaired, but may require a cutting polish, like Pinnacle Advanced Swirl Remover. Heavy oxidation, recognizable by a completely dull, chalky surface, is likely beyond complete restoration. However, even heavily oxidized paint can be polished to bring back shine if you start with a heavy duty compound like Menzerna Heavy Cut Compound. As with any form of paint damage, use the least abrasive polish necessary to get results. Even moderate paint oxidation causes paint thinning. As you polish, the oxidized (dead) paint is quickly removed. One question that frequently appears in my e-mail is, "My car's clearcoat is flaking off. How do I repair it?" Unfortunately, the only answer is to repaint the damaged body panels. Once a clearcoat fails due to heavy oxidation, it cannot be restored by polishing. ; In this regard, solid body paints are far more resilient. Maintaining your car's paint in perfect condition, especially if it's a daily driver, can be quite a challenge. Bird bombs are a simple fact of life. Just be aware that, in addition to looking really nasty, they are very damaging to your car's paint. Take care as soon as possible to remove bird droppings. If your paint is damaged, use a little polish to restore the surface. While tar, sap and bugs are not immediately harmful to your paint like bird droppings, if not removed, they will deteriorate your car's paint finish. When regular washing does not remove the tar, sap or bugs from your car's paint, use the methods described above. If your paint is damaged from tar, sap and bugs, use a good polish to restore the finish. Regular polishing is the best way to remove water spots and swirl marks. Choose a good polish, good tools, and be patient. To keep spots to a minimum, try using a detailing spray after you wash. A good detailing spray contains wax or silicone for protection and gloss. 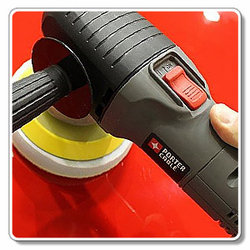 The wax will condition your paint and reduce hard-water-deposit spot formation. To keep swirl marks to a minimum, make sure you have good wash and dry tools, never wipe, rub or polish in circles (straight-line motions only), and be very careful with the use of buffers and polishers. Tough on tar� Easy on your paint!